How to Transfer Data from Apple Watch to Computer (Mac/Windows)? Apple announces to release the smart Apple Watch, which is equipped with a sensitive Retina display screen and use the sapphire glass panel that is transparent and stiff. Its hardness is second only to diamond. It is not just a simple watch, it can also monitor heart rate, support Siri assistant, weather interface, running track, telephone answering, recording, etc, and it also supports wireless charging. Users can quickly send and receive text messages, intelligent identification of the latest and frequent contacts on Apple Watch directly. Read more: How to Backup Apple Watch Contacts on Computer? Since Apple Watch can store above file types, here comes with a problem on how to transfer these files from Apple Watch to computer for backup, in case the useful data are lost or deleted accidentally on Apple Watch some day. We know that Apple Watch is working based on the iPhone 5/5S/6 and all files on the Watch can be synced to Apple iPhone. 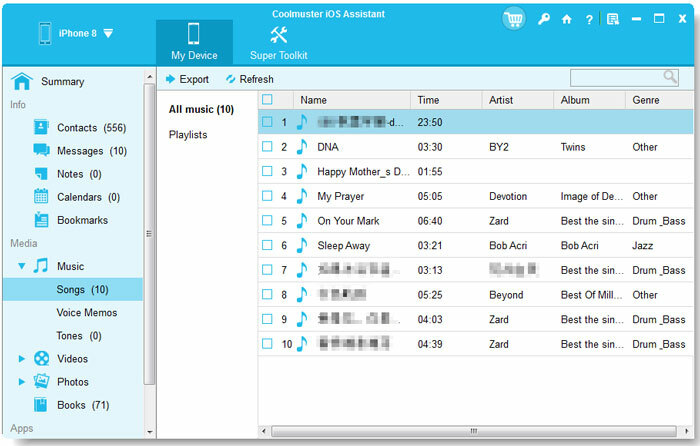 Therefore, we can use Bluetooth or WiFi to copy all files from Apple Watch to your iPhone, and then use Coolmuster iPad iPhone iPod to Computer Transfer or iPad iPhone iPod to Mac Transfer to transfer the data from iPhone to PC or Mac computer. 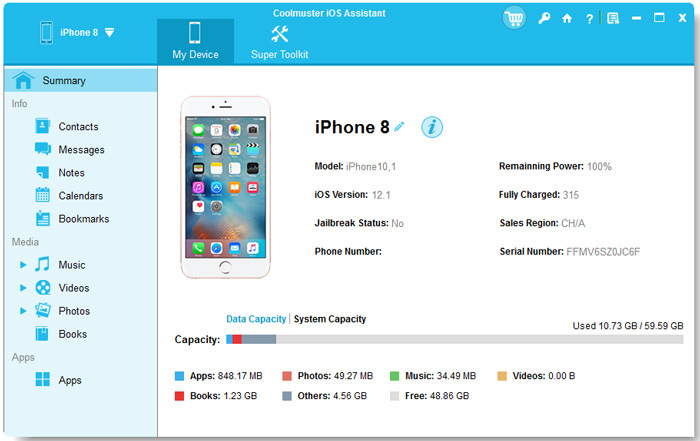 As a professional Apple Watch Data Transfer software, it is created to help iOS users to transfer and manage Apple Watch data on computer directly. This article is going to show you the step-by-step guide to transfer Apple Watch files like music, photos, contacts, text messages, health data and more from your Apple Watch to computer with the help of Apple Watch to Computer Transfer tool. First of all, please download the free trial version of the software. Read more: How to Transfer Photos from Apple Watch to PC/Mac Computer? After syncing your Apple Watch with iPhone, you can connect the iPhone to computer. Launch the installed Apple Watch to Computer Transfer software and you'll see your iPhone info displayed in the main interface. If the program can't detect your device, you can try to re-detect it by following the instructions on the interface. All your Apple Watch data that is synced to this iPhone will be categorized into different folders on the left panel. Just go to the target folder and choose all files you want to export. Then hit the big "Export" button on the top of the panel. The operation of transferring Apple Watch data to Mac computer is almost the same as the Windows version. Just launch the Apple Watch to Mac Transfer software and connect your iPhone to the Mac computer after you have synced the Apple Watch with it. Go to the left panel to select the files you want to copy to computer and hit "Export" button. After that, you can backup, view and even manage the Apple Watch data on Mac computer freely.